Wood roofs offer an unmatched natural beauty and a variety of style options. Natural wood roofs have been protecting homes for centuries. Wood shingles are aesthetically pleasing and provide natural beauty. At one time, the vast majority of homes in America were protected with natural wood roof shingles. Today, homeowners choose wood roofing for a variety of reasons - the traditional look, a desire to use natural materials, historic accuracy. Due to variations in the color, width and thickness of wood shakes and shingles, no two wood roofs are the same. With proper care and maintenance, a wood roof can provide attractive and reliable protection for your home. GF Sprague are your local experts for quality wood roofing services. We provide expert repair and installation in Newton, Needham, Wellesley and the nearby areas. Call us today for a free estimate! Cedar is the most commonly used wood in North American these days for roofing. 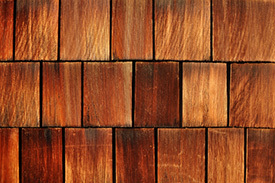 Cedar roofing comes in two varieties - shingles or shakes. A shingle is tapered and smooth on both surfaces. A shake is split to reveal the uneven natural grain of the wood on the face and is usually much thicker than a shingle. Wood roofs are naturally beautiful and long lasting, provided the roof is designed and installed along very strict guidelines. Because Mother Nature is most unforgiving of this completely organic material, it is critical to demand the best design, the proper materials and full trained craftsmen. GF Sprague provides all three elements for the successful construction of a wood shingled roof. Wood shingle roofs should be inspected and maintained every 3-5 years. Your existing wood shingle roofs can be repaired repeatedly, which can add years of protection to your home. We can give you a full assessment of your roof's condition and recommend options for keeping that great wood look for as long as possible. GF Sprague has been building, repairing and maintaining wood roofs for 40 years. We provide high quality wood shingles that look great and will last for years to come. Call us today at 1-781-209-6791 or contact us online to get a free estimate on wood roof installation for your home. We offer all our roofing services in Newton, Needham, Wellesley, Chestnut Hill, Weston, Boston, Brookline, Quincy, Watertown, Cambridge and throughout the surrounding areas.